Real gross domestic product (GDP) increased at a seasonally adjusted annual rate (SAAR) of 2.8% in the fourth quarter of 2010 with the release of the ‘second estimate’ by the Bureau of Economic Analysis (BEA). While a shift down from the ‘advance estimate’, which indicated a 3.2% (SAAR) increase, the economy continues to move forward, building on the third quarter 2010 GDP growth of 2.6%. The ‘second estimate’ is based on more complete source data than the ‘advance estimate’. The increase in fourth quarter GDP reflected a sharp downturn (-12.4%) in imports (higher levels of imports decrease GDP), and stronger growth in personal consumption expenditure (PCE) (+4.1%), exports (+9.6%) and non-residential fixed investment (+5.3%). These improvements were offset by a decline in state and local government spending (-2.4%) and private inventory investment (-3.7%). The decline from the ‘advance estimate’ to the current report for fourth quarter 2010 GDP growth is due to an upward revision to imports (previously -13.6%), and downward revisions to state and local government spending (previously -0.9%) and to personal consumption expenditure (PCE) (previously +4.4%). These negative impacts were partly offset by an upward revision to exports (previously +8.5%). 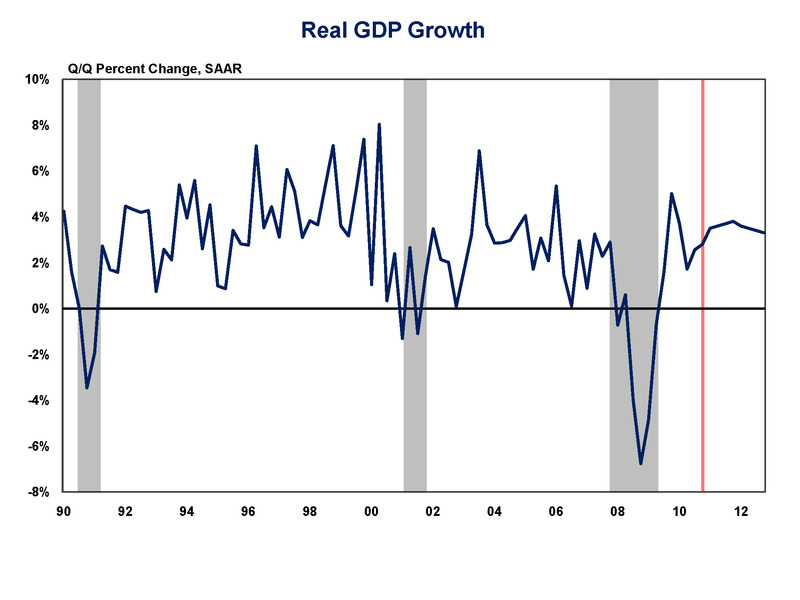 Overall, the shift in the composition of fourth quarter real GDP is positive. Solid improvement in PCE, which typically accounts for two thirds of GDP, is taking the lead as the driver of economic growth, while influence of the inventory cycle is beginning to fade. This shift will support a more robust recovery. Residential fixed investment (RFI), home building’s part of GDP, rose at 2.8% in the fourth quarter. While down from the ‘advance estimate’ of 3.4%, it represents a marked improvement on the 27.3% decline from the third quarter. We expect RFI growth to continue to accelerate through 2011 in line with the improving economy, the pace of employment growth, and the steadily declining (albeit slowly) unemployment rate. However, its contribution to GDP growth will be held back as long as ADC lending for builders remains excessively tight. The revised GDP estimate shows the economy continuing to improve in the fourth quarter. This momentum is expected to continue to build, with GDP growth rising above 3.0% in 2011 and remaining above trend through 2012. This entry was posted on Friday, February 25th, 2011 at 12:46 pm and is filed under Uncategorized. You can follow any responses to this entry through the RSS 2.0 feed. You can leave a response, or trackback from your own site.